Our elusive friend known to us as eb, or matchboxbook, sent this interesting specimen for our swap. You might have to look twice at these photos although it was difficult to photograph; hopefully you can see what's happening. He says, the book is sometimes called an impossible book. I originally had the idea of an impossble book before I knew there was such a thing and before I ever considered an "art career". 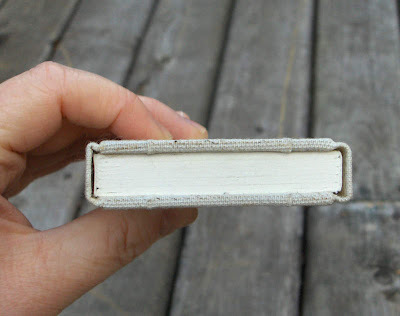 I learned to bind books from an art school class, and my impossible books were enabled. The book for the book swap is from a show a few years back. It was a group show titled, five times five, and the book has five colored lines running through it--one for each member of the group. 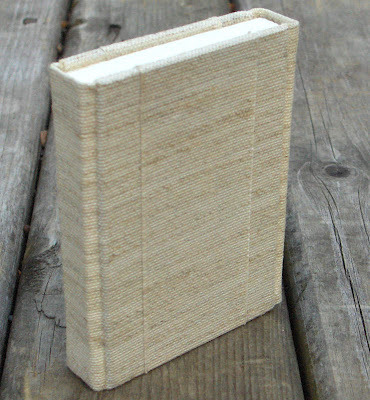 The paper is Arches text wove and the cloth is linen. Some people describe the books as an "inaccessible text", but I prefer to think of them as accessible with a little bit of work. Other examples of his "inaccessible texts" can be seen here. Visit eb on Etsy, at Matchboxbook.Etsy.com. it IS a terrific book, and it's mine now :) thanks for swapping eb!! are we ever going to learn the secret of this gem? Very intriguing! I had never heard of an "impossible book" before. neat, never heard of an impossible book, crazy! A cool puzzle..how did he sew both spines..so clever and certainly a creative first! Thank you for the positives. These books have been fun.